Native to Italy, this relative of the broccoli and cauliflower family grows as a lime green colored head having an appearance somewhat similar to cauliflower except for the cone-shaped florets that swirl upward forming peaks. Also referred to as romanesca or cauliflower romanesco, the Broccoli Romanesco provides a nice nutty texture and a flavor that is delicious either eaten raw or when added to salads. 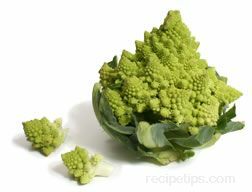 In addition, the Broccoli Romanesco can be steamed and made into a flavorful vegetable dish. When selecting, choose very dense heads that are bright green in color with florets that are not discolored or bruised. Wrap in plastic and store in the vegetable drawer of the refrigerator to keep fresh for up to 6 or 7 days.